Nick Kanelos, Aaron McDowell and Anthony Reinert paddle down the Missouri River for McDowell’s research project to understand environmental changes and effects of land use on the water. 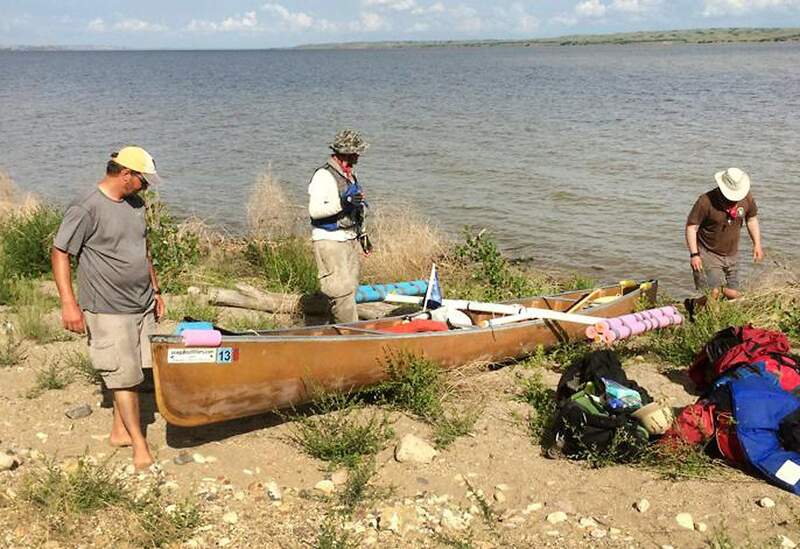 Nick Kanelos, Aaron McDowell and Anthony Reinert rest on shore after a long day of paddling down the Missouri River in their 23-foot canoe named Caroline. Aaron McDowell, front, and Anthony Reinert prepare to set off at the Culbertson Bridge in Culbertson, Montana. 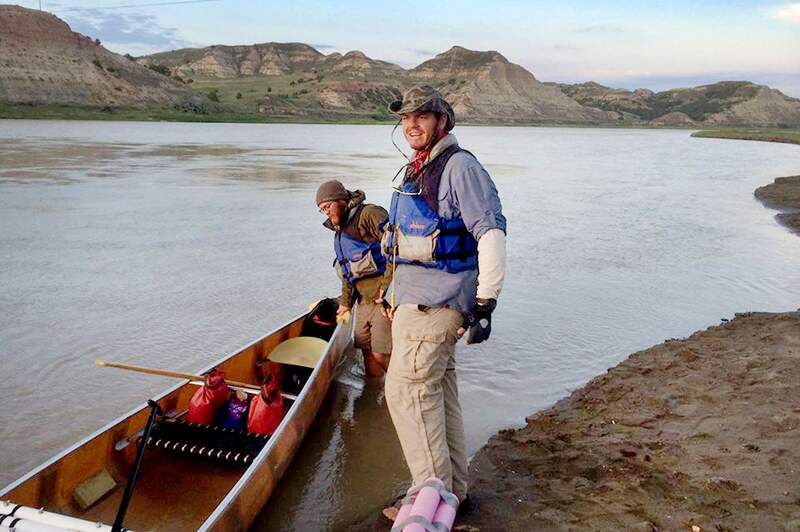 Fort Lewis College students Anthony Reinert, Nick Kanelos and Aaron McDowell have found their research trip of paddling down the Missouri River to be a challenge that is testing their patience, strength and trust in each other. They have three weeks to go. “Every time I take a journey of this nature, it is always a learning experience,” he said. 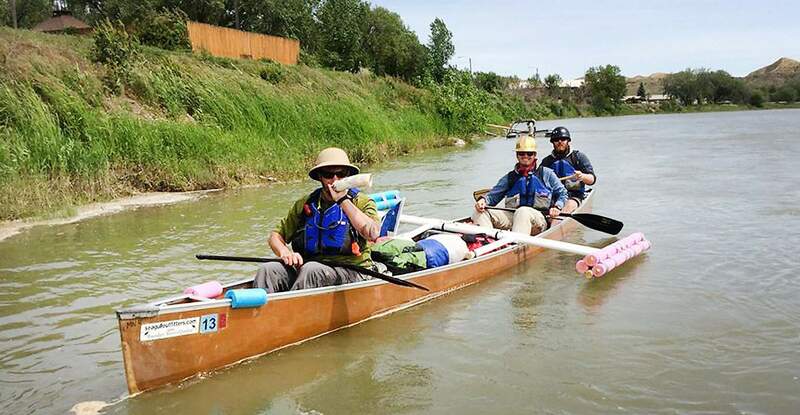 The trio kicked off the 2,400-mile adventure in Three Forks, Montana, on June 3 to survey the biological health of the river during an eight-week paddle trip. The team paddles for 12 to 14 hours daily and travels an average of 40 miles per day, he said. Reinert said in moments of hardship – such as encountering high winds, big waves or running out of water – the true mettle of the team is tested. Throughout the journey, the team has been collecting research for McDowell’s senior seminar project at FLC that focuses on the effects of agricultural runoff on the water system. The project is about understanding the effects of land use on the Missouri River, but the research the group is doing can provide information about other rivers, including the Animas, said Heidi Steltzer, professor of biology at FLC. The Animas River is similar to the upper regions of the Missouri River near Three Forks, where the team started its adventure, she said. When they reach St. Louis, Missouri, the three students will have completed more than 2 million paddle strokes in their 23-foot canoe named Caroline, Kanelos said. “She has been a fantastic ship for us and has granted us safe passage in very trying conditions,” he said. Hours after launching from Three Forks, the team endured sunshine, rain, thunder, lightning and hail. Kanelos said the team had to learn very quickly how to tie down anything loose in the canoe, throw on storm gear and pull into a nearby semiprotected shore. Along the way, the team has slept on many sandbars, fishing launches and official campgrounds, as well as residents’ homes along the route, outbuildings and unfinished shop buildings. McDowell, the team’s researcher, has been taking samples of plankton in different parts of the river to understand environmental changes and effects of land use on the water. He also is looking at pH levels, water turbidity, oxygenation and amounts of dissolved nitrates and phosphates in different sections of the river, Kanelos said. McDowell’s expectation is he will be able to see significant impacts from agricultural runoff, Steltzer said. “One of the most interesting things we’ve seen is how drastically the river changes from its headwaters to Pierre, South Dakota,” McDowell said. The higher-elevation riparian areas are dominated by cottonwood forests, while the plains consist mainly of rolling grassy hills, he said. “There is a very subtle beauty that changes slowly, and it is hard to describe without taking the human-powered pace that we are traveling at,” Kanelos said. The team plans to reach its destination point in St. Louis by Aug. 1.